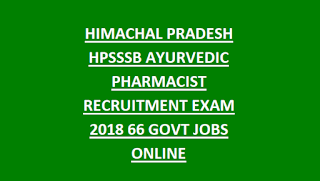 Himachal Pradesh SSSB HFW Department Ayurvedic Pharmacist Examination 2018: Himachal Pradesh Staff Selection Commission has been released notification to recruit the available vacancies in Health and Family Department department for 238 Ayurvedic Pharmacist jobs (Post Code-698). This is recruitment is completely contract basis. Eligible candidates can apply online without getting late by 23-09-2018. 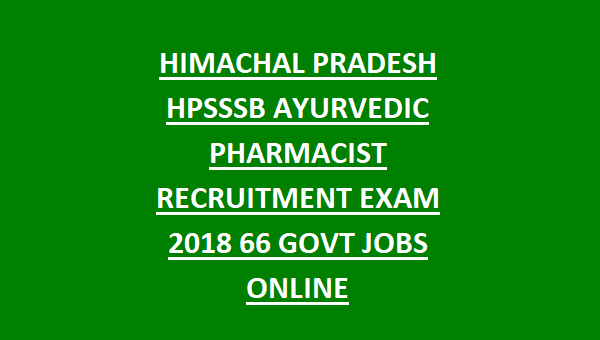 The selection for Himachal Pradesh SSSB Ayurvedic Pharmacist Recruitment 2018 is will be in two stages. The eligible candidates can apply through online only for this recruitment. Offline mode applications will not be accepted. For more details regarding this recruitment of HPSSSB Ayurvedic Pharmacist Vacancies eligibility criteria, age limits, exam pattern, Pay scale, qualifications please see below. Note: Candidates who are already applied they are no need to apply again. Click here to see the official advertisement of Himachal Pradesh SSSB HFW Department Ayurvedic Pharmacist Recruitment. There are total 238 vacancies available in Himachal Pradesh SSSB Health and Family Welfare Department. i) 10+2 or its equivalent from a recognized board of Himachal Pradesh government or central government. ii) Must have qualified Diploma in Pharmacy from any recognized university or board. The candidate's age limits for General 18-45 years, and for the reserved candidates up to 5 years of age relaxation is given. Selection for this HP Health & Family Welfare Department Ayurvedic Pharmacist recruitment is held in two stages. Examination will be conducted for 200 marks with 180 minutes duration. Test will be conducted in the form of Objective type multiple choice questions. Paper will be given in the both languages of English and Hindi. Those who are qualified for written test they will be called for the personal interview. Interview will be conducted for the 30 marks. Written test will be in the form of Objective type screening test. The candidates who are having the eligibility criteria they may apply online through the official portal of Himachal Pradesh SSSB@www.hpsssb.hp.gov.in. Before applying for this jobs please read the official notification carefully and then proceed for apply. Click here to Apply Online for the Himachal Pradesh Health & family Welfare Allopathy Pharmacist Recruitment 2018. Please share this HPSSSB HFW Department Allopathic Pharmacist Recruitment 2018 article to your lovable friends through online via social web.